Includes a green hero complete with punching, kicking, and even pushing objects! Also includede are two enemies that are either killed by jumping on them or punching them! Instructions on how to use the sprites included. Lovely! Thanks for sharing these! These look amazing, huge help! [EDIT] Changed the color on one's shirt to have two players. 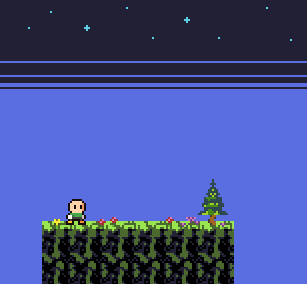 Here's where my prototype is at! Hello, the pixel art you have really hits me right in the childhood, I would love to make a game with it, I would like to know if its possible to get the main character ( the green one and blue one that you posted ) in 1 sprite sheet , all blue or all green , that way the main character could kick and swim and have a parachute, let me know, thank you for your amazing artwork, you have a new admirer! 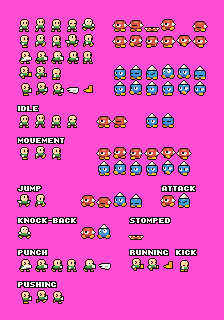 This is such great sprite sheet - I'm using it to learn video game development. Thank you so much!